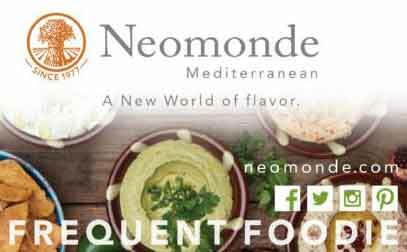 Neomonde Mediterranean in Raleigh, Morrisville, Durham & The Triangle! 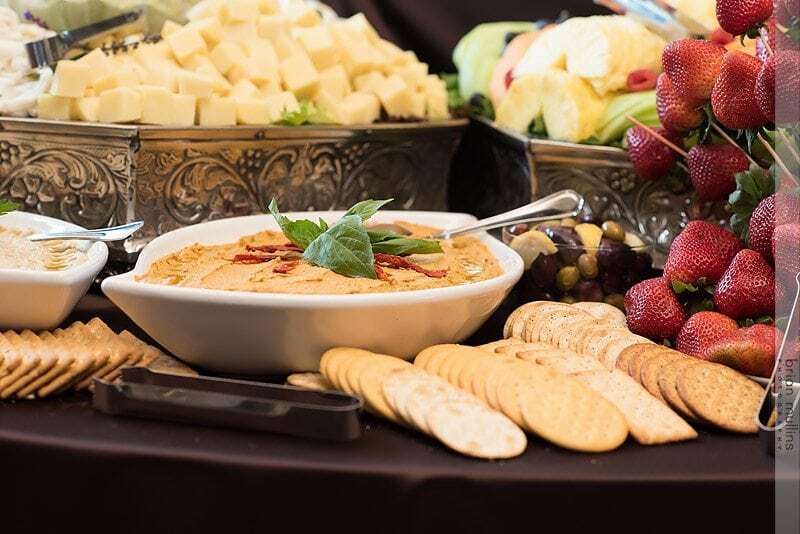 We would like to invite you to visit our family restaurant, where you’ll discover a wonderful mix of traditional and contemporary Mediterranean menu items, including a wide variety of vegetarian, vegan, and gluten-free options. 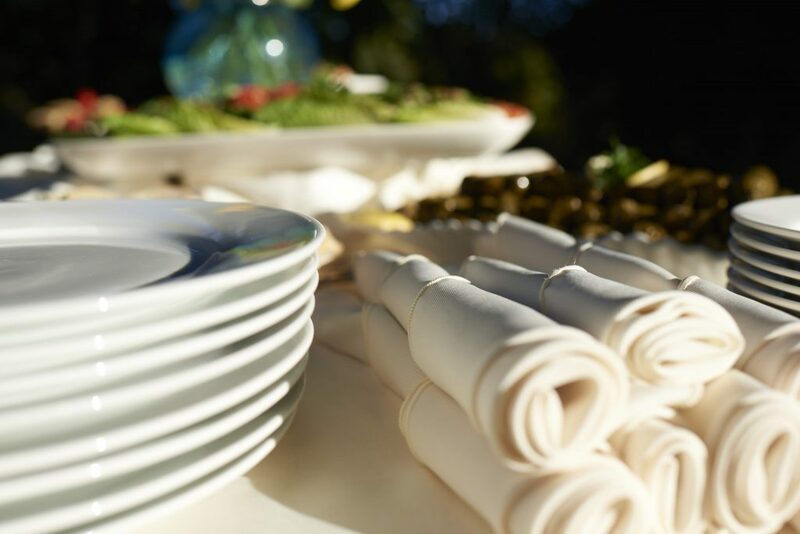 Since 1977, we have proudly offered our guests flavorful, gourmet quality dishes at an affordable price, made fresh each day from our family’s personal recipes. We believe that healthy, honest food has soul so it not only tastes good and is good for your body, but it makes you feel good too! Come join us and see why Neomonde was voted the #1 restaurant in the Triangle by diners on TripAdvisor. When the Saleh family immigrated to the United States in the 1970s to escape civil war and to pursue educational opportunities, they brought with them their passion for bread and, most importantly, their mother’s secret recipes. 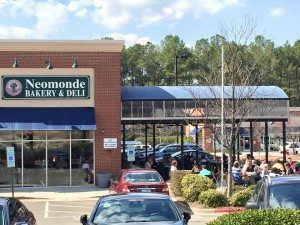 With help from an uncle, a converted pizza oven, and rented space in a Raleigh strip mall, four brothers – and their mother, Cecilia – opened Neomonde Baking Company in 1977. They decided to honor their new country by naming the business Neomonde, or “New World.” Their goal was to make wonderful, handmade bread just like their mother’s. Starting with just a few types of bread, Neomonde began to gain discerning wholesale customers like The Irregardless Cafe and Harmony Farms. As the Raleigh area grew, so did Neomonde’s customer list and product offerings. In the early 1980s, they moved from the small storefront space to their own building on Beryl Road. 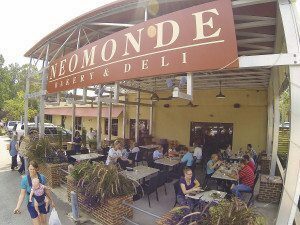 In 1989, the Saleh brothers expanded Neomonde in another positive direction by opening the restaurant portion of the business. All their menu items were prepared each day by hand from family recipes using only authentic ingredients, most of it made by Cecilia herself. At first, their food was only available for take-out, but eventually the brothers added a dining area and patio seating to keep up with their ever-expanding popularity of loyal, healthy-minded customers. Regulars began to ask where they could shop for their own healthy ingredients to use at home. To answer this ever-growing demand from their restaurant friends, Neomonde launched a small Mediterranean grocery where customers could purchase all the ingredients and spices to prepare healthy dishes in their own kitchens. The food was delicious. Had the lamb kabob, fall best salad and tabouli. Lamb was moist and the salads were very flavorful and fresh. Will be coming back next time I'm in the area. Broad selection of Mediterranean dishes. A favorite is ordering the three sides sampler. Pricing is reasonable and service is quick and friendly. The dining room offers spaces for large groups and quiet seating. Usually during lunch, the place is very crowded. Fresh savory, well-prepared clean food. Vegan and vegetarian alternatives. Friendly staff and baklava too! I really like the selection at Neomonde. To me, the food tastes more authentic than some of the other Mediterranean chain restaurants in the area. We’ve ordered this for take out when out-of-town family were staying with us and there was something for everyone in our group. That saying a lot considering our family includes a diabetic, someone with lactose intolerance, and some run-of-the-mill plain-ole picky eaters! First time ordering for take out for me and my husband, and it was just delicious! We both had the kebabs plate, which includes any 2 sides, what a great deal 🙂 both my husband and I would’ve given this place a 5 stars though if the kebabs of steak and chicken weren’t so dry. But I love the healthy options so thank you for being 3 min from us! Ducked in for a quick bite at lunch with a coworker. Loved it so much, I came back again a couple days later to enjoy a more relaxed experience. Both times the service was friendly and fast. The food was... well... what brought me back- in a word: great! Amazing selection of food for any specific dietary needs! Wonderful staff, welcoming environment. I will definitely be returning. The food is great! Going at lunch during the week can be chaotic. One lady in our party for her food 15 minutes later than the rest of us. The taste of the food made up for it though. Amazing food. 1st time eating here. A friend who eats here a lot brought us here. We are from out of town. I can't wait to come back to eat here again. Thank you for the amazing dinner. Loved it. Great food. Friendly service. Normally I give 4 star for counter service, but the taste made up for ordering at a counter. I highly recommend this place. First time eating this type of food and I loved it. I enjoyed the flatbread pizza style vegetarian which was delicious! The portion for lunch was satisfactory if a bit petite for my appetite and preference. I also tried the warm tomato and green bean salad, like stewed tomato with green beans. Truly great! overall quality was excellent. Prices are slightly above average for lunch. The quality of the food justifies slightly higher prices yet the portion sizes could be more generous. Excellent Mediterranean food here. I had a great lunch plate of 4 vegan sides (I created my own plate). Everything was delicious but my favorites were the cilantro jalapeno hummus and Tabouli. I will go back soon. Good lunch or dinner. Fresh options. Out door seating. Enjoyed our meal. I tried here several times on weekdays with colleagues. We plan to go bit early for lunch as its crowded. It’s perfect for individual orders and lunch. Good service and healthy food. First time When ordered 2 half Pita packets with chicken, I thought may not be enough but they are bit heavy. Reasonable prices. Informal setting with both indoor and outdoor seating. Food is on display so you see what you are getting. Food is delicious. This is my families go to place for Mediterranean in the triangle. I tried here several times on weekdays with colleagues. We plan to go bit early for lunch as its crowded at peak times. Its healthy and tasty food. I don’t know the name of some sweet comes with any purchase is very sweet and heavy. I just skip that. Very nice kebab place with a lot of fresh sides options. One of my favorites is cilantro jalapeño hummus. A very good assortment of desserts. They also offer some mediterranean products. They have a sitting outside. Delicious and surprisingly quick moving service line--they have all the food on hand and plate it up on the spot. Never disappointed. The Veggie lasagna with chicken salad and grape leaves is a personal favorite. Baklava is on point. Best Lebonese food in the Triangle. Great for all diets. I'm vegan and am never bored with the selection. Very fresh and flavorful. Always great, but be prepared for a wait to order and receive your food. Been a regular at this location and the one in Raleigh. Good food but feels like this location the food quality is slightly different. My last visit the order was incorrect and then had to wait an additional 20 minutes to get that fixed after 2 reminders. Great place to eat to hang out with friends or just a quick bite. I got the kale salad with lamb kabob. I felt my particular meal was a little overpriced for what I got (a medium bowl of dressed kale with walnuts, golden raisins, and a lamb meat kabob for 10 bucks) albeit it was delicious. The others in my group had pita shawarmas which seemed like a good price for the size. Revised review**Went back, staff this time was very helpful and attentive. Midway through our meal someone came out and made sure we had everything we needed.Food is still incredibly good, big fan of the pita pockets!Large selection of sides to choose from, lots of healthy options too. Love this place. If you’re looking for a good variety of Mediterranean food this is the place to go. So much better than the rest of the chain places in the area. The food is quite tasty, the staff is friendly and helpful, and the prices at reasonable. 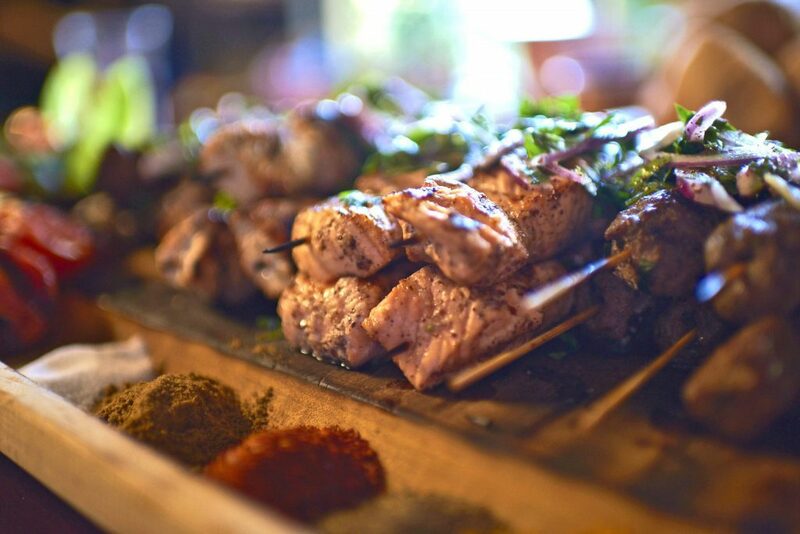 If you like Mediterranean cuisine, Neomonde is a must try! First, plentiful parking. Second, you can get in/out as quickly or slowly as you like. If you know what you like, the place is efficient. If you are there for the first time or new to Mediterranean, you are up for a treat. Staff is friendly, informed, and informative. They will take time to explain, introduce you to alternatives, or suggest what goes well together. It shows that the staff is well taken care of, because the place is well taken care of, clean, and inviting. You should definitely give Neomonde a try. (Warning, you will get hooked). This is the TO GO place for delicious Mediterranean food. The portion sizes are generous and the pricing is reasonable. They have free pita bread with food purchase which is very soft and delicious. Absolutely worth a visit, nay, multiple visits. Delicious!!! Made fresh. Plenty of variety. Tzatziki is fab. Get a platter to try out different things. Delicious Baklava. Need I say more? Lots of “grocery” items to purchase here as well, like rices, oils, and sweet treats. Covered patio. Always enjoy lunch at Neomonde. Gave four stars because the cashier knew the coffee was cold but didn't do anything about it. The food was good all around. We were a group of 8 and I tasted all the dishes. Everyone was good. My only wish is that the restaurant served lamb gyro, it serves only beef & lamb mix gyro. The staff are always very friendly, prices are great especially for the portions and quality of food. You always have a lot to choose from in entrees, desserts, sides, and groceries. Monday I went for takeout for dinner, and this was my ump-teenth time visiting. I got the take 4 and those four items Gabe me two meals. And I'm super excited they have vegan baklava, this last visit was my first time seeing that. Thank you for doing that! Don't change anything, keep doing what you're doing. Everything you make is well seasoned, good knife cuts, cooked properly, and well balanced and flavorful. I eat a plant based diet and I love that neomonde is just around the corner from my house so I can get a healthy meal that will fill me up right for a great price. Delicious food, lots of choices, I especially love the cilantro hummus. The best Mediterranean food option in the Cary / Morriaville area. The food was fresh and delicious. The prices were great. The owners were kind and welcoming. This is a must try restaurant! Get the chicken shawarma pita! Yum! Excellent! Food was extremely delicious. Loved the lamb shawarma. The line was long at 11:30 am on a Monday, but it moved fast.Will visit again. Neomonde has been a local favorite for many years now. The food is always excellent and the staff are always polite. I have never had a single bad experience. Love this place!!! I have had lunch here for more than 15 times and I have managed to experiment with different sides in my Lunch platter(1 falafel or shawarma, 2 sides and 1 baklava!). And almost all of the times, the choices never went wrong. It can also be a good place to chat with friends and have lunch or dinner. They are very stingy when it comes to giving complimentary pita breads. In all these years I have been there, they would let us take 3 pita bread slices. These days, they give you only 2. Trust me, 2 pita bread slices is never enough to eat it with sides.And this place also doesn't honor any discounts. They would act like they are trying to give you a discount but they would say system doesn't accept. I tried asking them couple of times about it and decided that I would only get the same answer never the less.Service has also deteriorated in the recent times. Orders take longer to be fulfilled.Good tasting food and pastries are what keeps this place going. Just a wonderful Mediterranean place to eat. Service is fast and efficient, but if you get there a little after noon, don't be surprised by a line of all the other people waiting to order and enjoy the great food. Don't forget to get some extra Baklava to take home! This place is truly a great find. Personally, I love chicken shawarmas, and there’s very few places that can truly do it right. It’s taken me years to find any restaurant that can make it this good. In the past 2 weeks alone; I’ve returned 3 times. Their portions are fairly large for such a decent price, and the food quality is incredible. The atmosphere is lovely as well, with covered outdoor seating to fit your desires. The entire staff is very friendly and attentive. I would definitely recommend this place for a quick bite to eat. Decent fresh healthy food. Lots of Vegetarian options, quick service. Eat in or carry out. I’ve been eating here for years and the food flavor and quality is consistent and good. One of the best “fast food” option around. Had excellent selections and very great foods. The service was superb and staff were so very friendly. Will definitely stop in whenever we are in the area! Great selection of mediterranean and middle eastern goodies, and an excellent place for vegetarians - even for vegans! Falaffels are fried to just the right crispiness, and the sauces are fantastic. 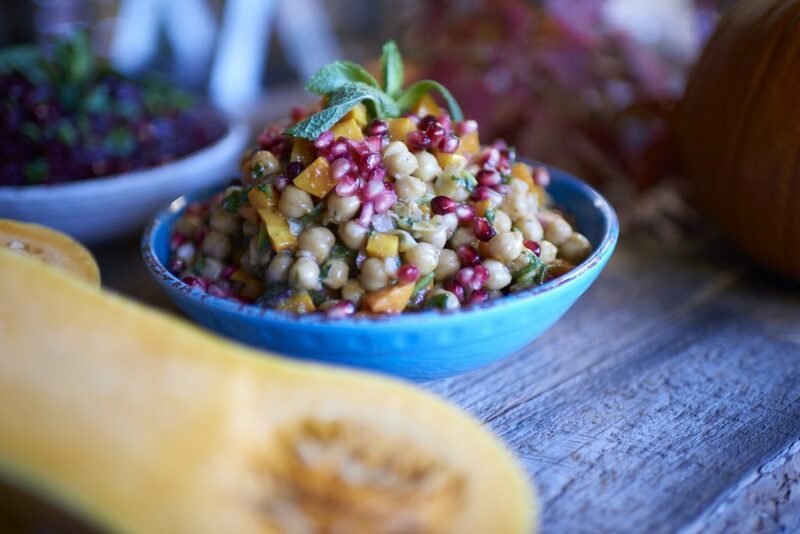 My favorite side is the butternut squash and chickpea salad - a vegetarian dish that is set to delight. I was also favorably impressed with vegan baklava (though, I must admit, their non-vegan is better...). Always great food. Crowded but fun at lunch. The pitas are amazing and will fill you up! A great selection of sides and a small market there also. The staff is always great and friendly. Take your coworkers for lunch. Delicious food, family friendly, excellent service, and they have something for everyone. They do very well serving sizable groups even on a busy weekend. I am still dreaming about the most amazing cilantro jalapeño hummus I had there yesterday. Seriously, go. Try some. And report back. Food was fresh, well prepared, proportioned, priced and served amazingly well. 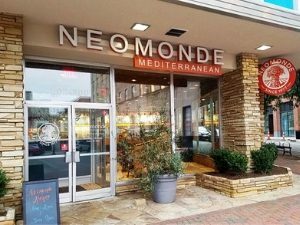 I have been to several Mediterranean restaurants in the Cary/Raleigh area and Neomonde was the best hands down in my opinion. Lunch time is very busy when our office group of 7 showed up but line line moved steadily.